Allow your Realtor to host an Open House with fragrant apple cider brewing in a slow cooker. Put a tray of holiday treats out for buyers to enjoy while viewing your home. 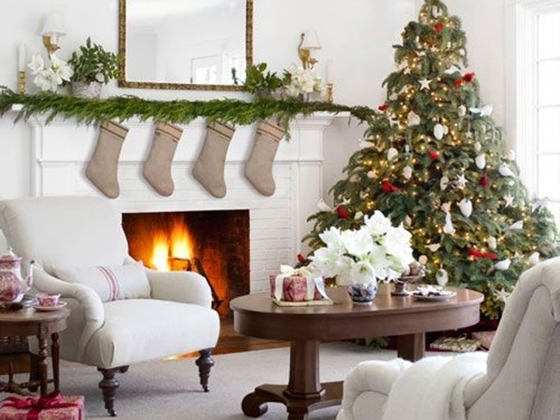 You can use the Christmas décor and joyful ambience to allow buyers to experience how cozy and inviting your home is. If it’s icy and cold, make sure pathways and entrances are de-iced and walkways are well lit. As with selling any other time of year, keep pathways open and sweep leaves and debris to give an overall “clean and fresh” appearance. Do the necessary “touch ups” with paint and trim. Spruce up the yard and keep decorations tasteful and remember that quite often “less is more”. Turn up the thermostat and put the fireplace on while playing soft music in the background. This allows buyers to feel relaxed and comfortable in your home. The overall experience is what helps to sell your home. Remember to check all lights to make sure no bulbs are burnt out. Turn all the lights on for showings because a well illuminated home not only feels more approachable, it allows buyers to see what the house offers. With all the preparation of dinners, entertaining, and shopping, take some time to de-compress and allow your Realtor to do their job in marketing your home and getting it SOLD.